Listed among the highest-rated Katy apartments, Camden Grand Harbor features spacious one, two and three bedroom apartment homes. 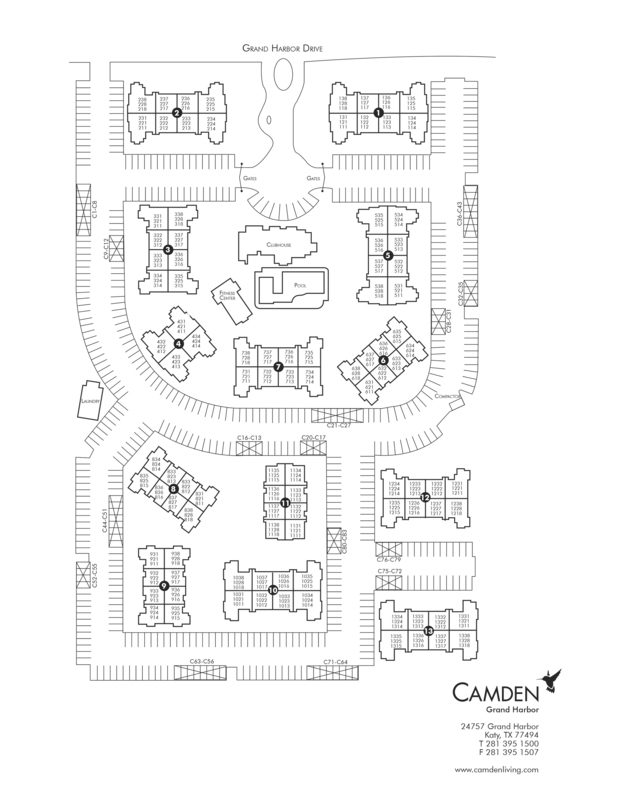 Located off Katy Ft. Bend County Road and Grand Harbor Drive, Camden Grand Harbor apartments offer direct access to I-10 and the Grand Parkway, making Downtown Houston commutes a breeze. Come experience everything our pet-friendly apartment community has to offer. Take a swim in the resort-style pool with lap lane and tanning deck, or enjoy the WiFi in the fireside lounge. Entertain your friends at one of the outdoor grills with dining areas, or get some work done in the business center with workspaces and coffee bar. Stay in shape in the fitness center filled with cardio equipment and free weights, or take a walk around the beautifully landscaped community. Rest assured your pets will love it here too! We have a private Dog Park just for them. Each apartment feels like a custom home with spacious floor plans, gourmet kitchens with custom cabinetry, black or stainless appliances, granite countertops, garden tubs and large walk-in closets. Select apartments include wood-style flooring, vaulted ceilings, and kitchen islands. Covered parking and detached garages are also available. Camden Grand Harbor puts you close to the best of everything in Katy: from shopping and entertainment at Katy Mills Mall and La Centerra, to Katy City Parks and the award-winning Katy ISD. See yourself living in the most luxurious apartments in Katy, Texas? We do! Come home to Camden Grand Harbor, you deserve it. Check out available apartments here. At Camden, your pets are family too! We welcome cats and dogs, up to three pets per apartment home, with a full-grown maximum weight limit of 99 pounds each. Call us with any pet-related questions! Visitors may park in any unassigned, uncovered parking space. We ask that spaces directly next to buildings are left for our residents. Garages and covered parking are available for you! Detached garages are available for $100 per month, carports for $25 per month.